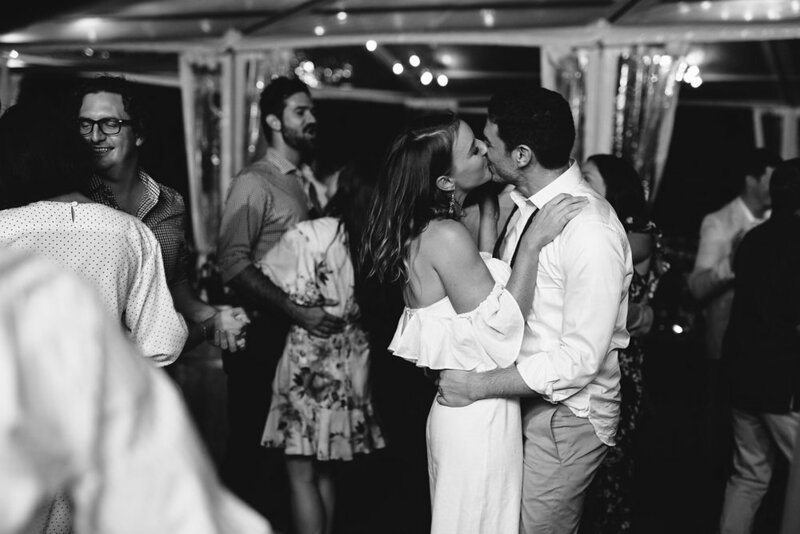 Chris & Julia met in 2008 and it was love at first sight! Every year they celebrate their anniversary with a vintage bottle of 2008 Moët & Chandon. Now they will have another anniversary to celebrate as well, take a look to see how their magical day unfolded. 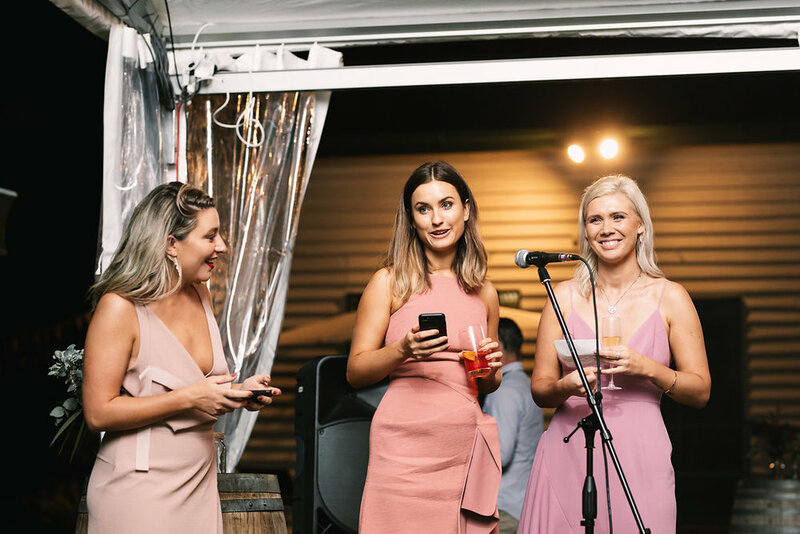 Julia, along with her bridesmaids, parents and brother stayed in this beautiful house in Indooroopilly, about 20 minutes away from Brookfield. They found it on Airbnb and it is possibly the cutest house with so much charm and character! It was the perfect location for those behind the scenes photos too. The girls relaxed by drinking champagne and eating home made banana bread whilst getting ready together. They were calm but excited for what the day would bring! The guys relaxed and played golf that morning. Truthfully, guys don’t really have a lot to do the morning of the wedding other than to just to be with family and their closest friends. Whilst Chris was getting ready, he opened up a box from his beautiful wife to be as a present for their wedding day. The card is just the cutest thing ever! 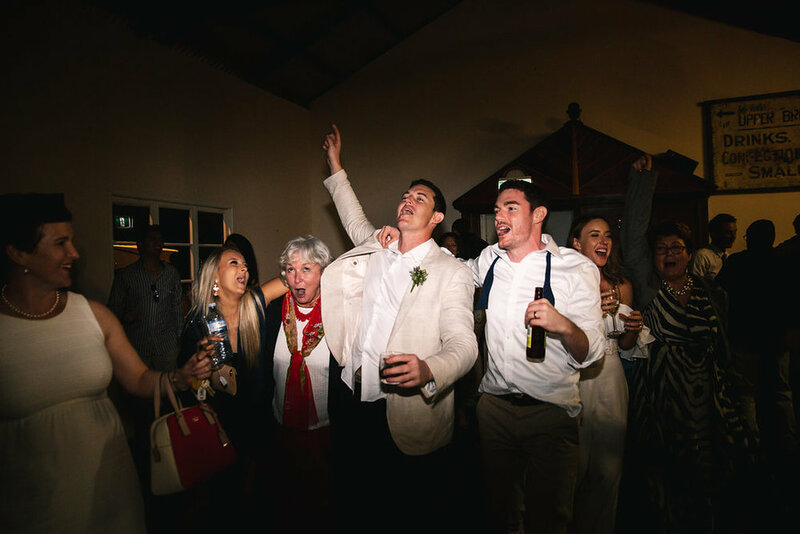 Julia & Chris opted to do a First Look, for those who haven’t heard this before, it’s when the bride and groom have an intimate moment together with their bridal party to get their reactions without being in the presence of everyone. It is more intimate without the fuss! It’s also a nice way to get photos before the ceremony which leaves more time to enjoy your time with your guests. It was so beautiful, raw and so emotional! The photos just speak for themselves. Julia & Chris had booked the beautiful little Upper Brookfield Community Hall for both their ceremony and reception. 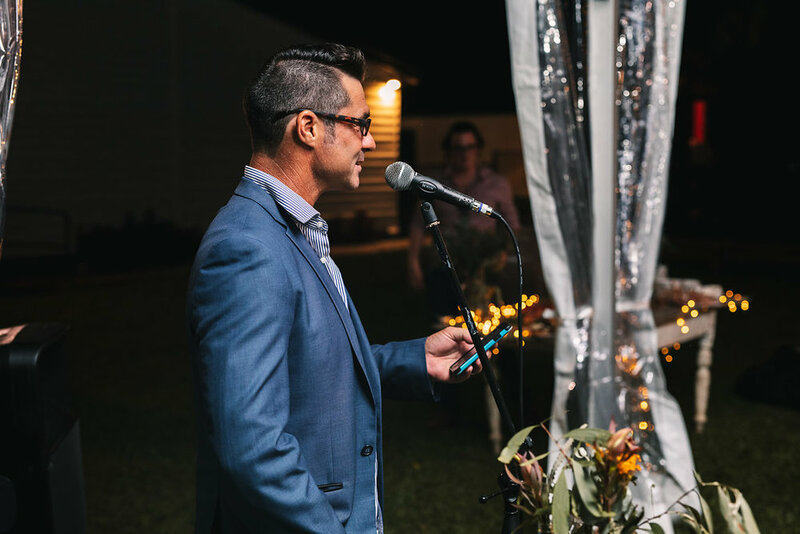 It was a gorgeous venue with a hall and a piece of land next to it, it is approximately 30 minutes west of Brisbane CBD. The drive itself is worth it, it is gorgeous, with all the rolling green hills and roads lined with overhanging trees. Guests arrived and were greeted by the grinning Chris who was eagerly waiting to marry his bride. Julia and gang arrived and gathered out the front while myself and Pastor Jake calmed some nerves and confirmed a few items. Once we got the go ahead we were ready to whisk this bridal party down the aisle. Julia and her girls walked down the aisle to an acoustic strum of a guitar. The hall was filled with emotion. 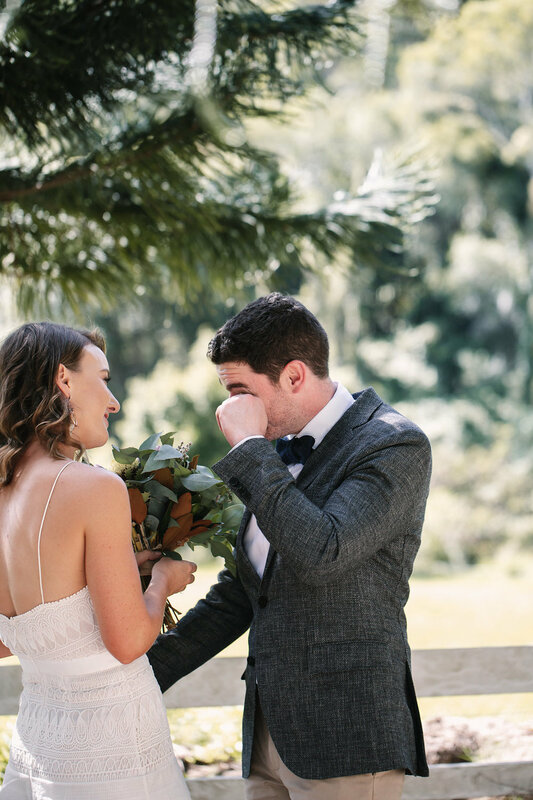 There was not one dry eye in the room, the vows were emotional and filled with love. Both parents looked on in complete adoration for these two amazing people and were now gaining a daughter and a son. Julia really wanted a natural themed wedding with lots of foliage and native flowers. Their bouquets were made up of natives and lots of greenery. 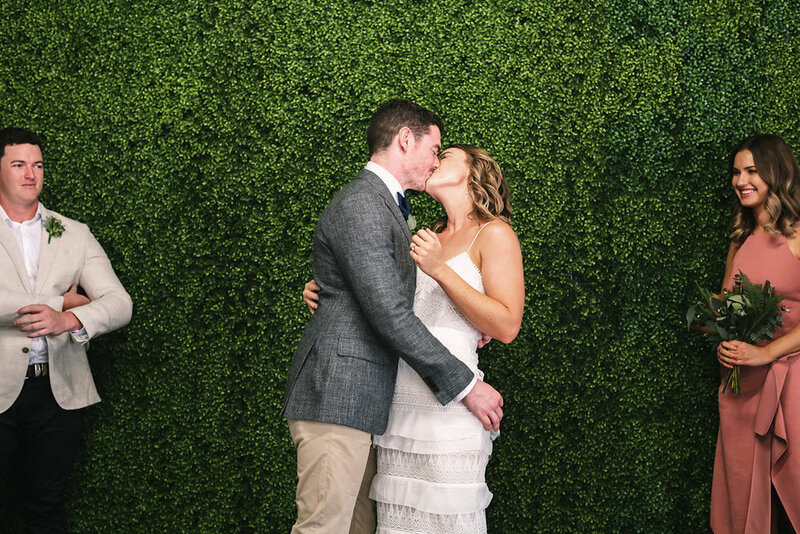 Their ceremony backdrop was hedge lined wall with a natural foliage at the top. Instead of rose petals to line the aisle we used gum leaves which looked beautiful and unique. 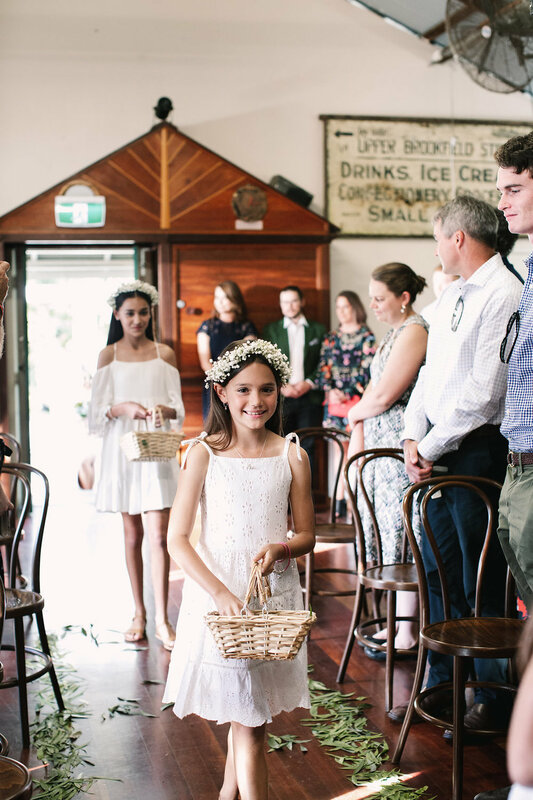 The beautiful little flower girls also threw gum leaves from their baskets instead of rose petals. TIP: As they chose a blank space they had to fill the space. They hired these beautiful bentwood chairs for both the ceremony and reception. Once the ceremony was complete, everyone was gathered for their group photo. The staff and myself quickly moved the chairs from the ceremony location to the marquee without a fuss. Think of different options like that, including flowers and decorations, to keep the costs down. After the ceremony, guests walked outside and were greeted to the new Mr & Mrs! Drinks flowed, music played and a four meter table filled with treats and cheese kept everyone at bay. There were lawn games to keep the little and big kids amused too. Whilst Julia & Chris went offsite to make the most of that last bit of sunlight with their incredible photographer, Tom. The great thing about these types of venues is that you have free reign to do what you want (respectfully, of course) but it was wonderful! Chris & Julia provided their own alcohol on the night which saved them money and they had more to choose from. The amount of options offered to all to their guests was unbelievable, seriously that was one impressive beverage list guys! They even had dessert wine on there, not many people think about that one! The venue was great as you have the best of both worlds. They hired it from the Friday morning and had access to it until the Monday morning. They got around expensive weekend delivery costs by having everything arrive to the venue on the Friday and picked up on the Monday. It also gave them time to style and put lighting up the day before, another way to keep the budget down. The reception was a clear marquee to the right of the hall. There were two long tables underneath below hanging festoon lights. There was no seating plan or set tables which made it feel more relaxed. The tables had natural linen runners down the middle with mismatched jars of foliage. 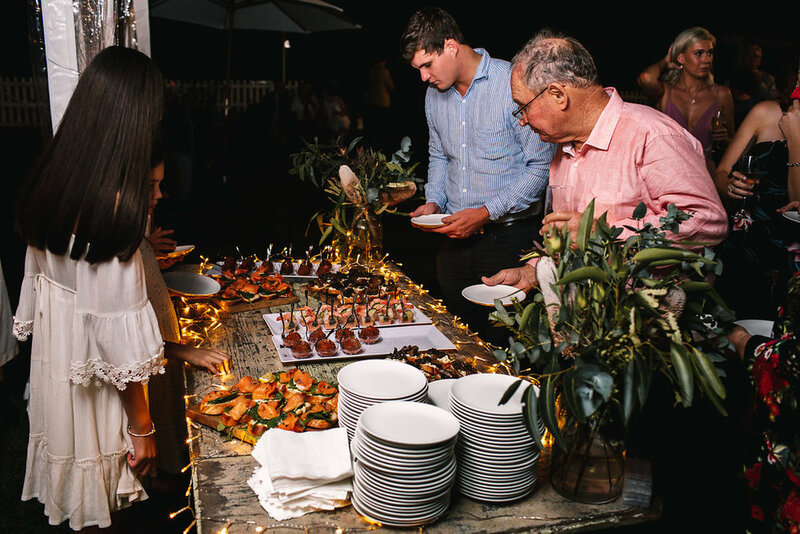 Julia & Chris were super relaxed, about 4 months prior to their day their original cater had to cancel as they had closed down. Instead of going into a panic they looked around for someone else who did offsite catering of the similar style. They stumbled onto Salt, Meats and Cheese, (who are amazing by the way, we probably get pizza and their famous truffle gnocchi from them once a week, no judgement). They booked them in without even trying the food, until a week later when they got it on UberEats, the booking was definitely confirmed after that. SM&C did a table filled with appetisers for the entrees, from cocktail prawns to arancini balls. Guests made their way to graze on the food presented. This way was less formal, some people didn't sit down, some sat at different seats and some stood in circles of people discussing live. It was exactly the vibe Julia & Chris wanted. For mains, trays of lasagna accompanied by massive rocket, pear and walnut salads were placed in the middle of each table. This created a feasting option for guests to help themselves. Think more of a family long lunch with everyone nibbling and going in for more. We absolutely love this option as it does feel more relaxed. After the yet again emotional speeches, guests were left to their own devices as Julia had a surprise change of outfit prior to the cake cutting. Julia completely rocked this two piece pant suit, it was fantastic! Once the cake was cut everyone helped themselves to the array of petite desserts in front of them. 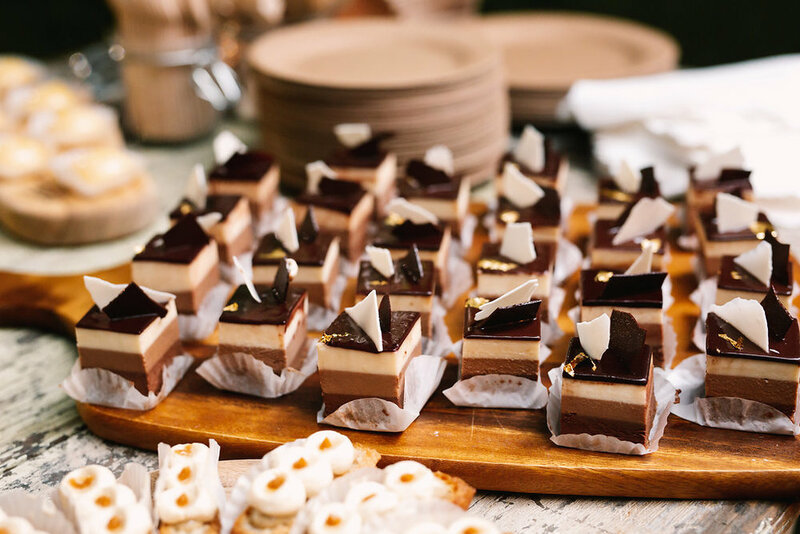 From lemon tarts to salted caramel fingers it was perfect as it got everyone out of their seats and straight onto the dance floor from there. 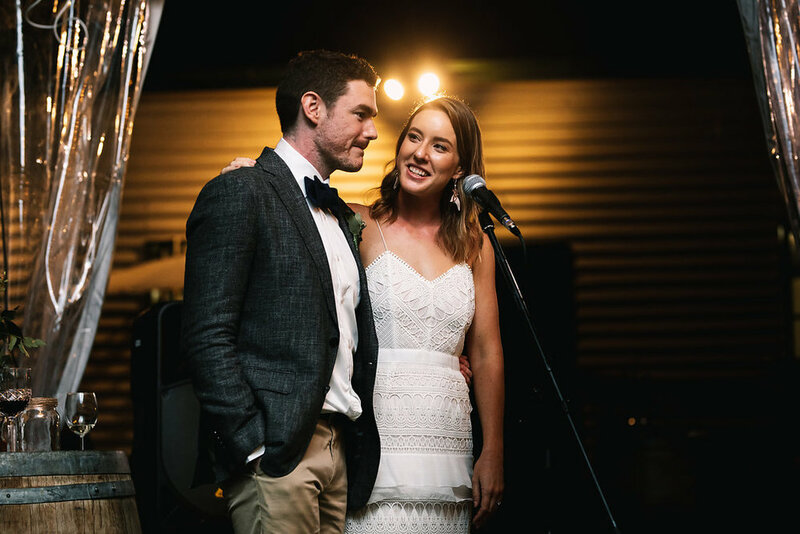 Julia & Chris danced to "Home" for their first dance which was covered beautifully from their one man band and cousin, Michael Johnson. We slowly then introduced both sets of parents onto the dance floor and then the bridal party. With this venue there was a noise limit after 10pm so we moved everyone inside the hall to keep the party going. From there the whisky bar was open for the guests. Everyone partied well into the night until the buses arrived and I am pretty certain the partying continued back in Brisbane. PS. 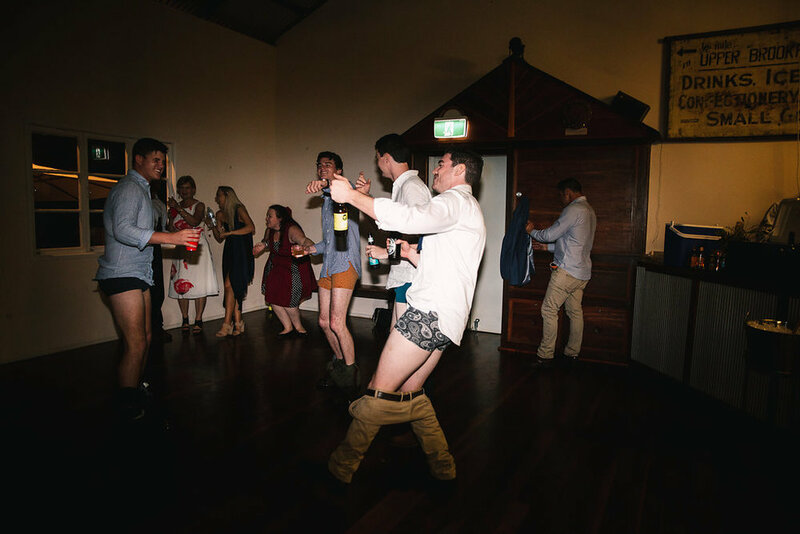 Is it even a wedding if Eagle Rock comes on and the men don't have their pants around their ankles?! Didn't think so. Thanks guys for being great to work with! Thank you so much Julia & Chris, it was so wonderful being a part of your amazing and emotional day filled with love and family.